Although traditionally the lake is lowered for winter pool. If we continue to get rain (like seen earlier this year), the lake should be returned to full pool by mid April. 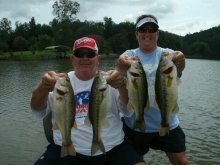 Each month during the spawning season the lake and its inhabitants such as the Coosa River spotted bass and largemouth bass go through some changes. Like many lakes in Alabama Weiss lake will still be down until mid April. March is the time for prespawn bass to begin their travels towards shallow water spawning grounds. Upper Weiss lake can be downright muddy from the heavy rains of March, creating a run-off or stained-to-muddy water look coming out of Georgia, Weiss lakes Coosa River headwaters. Not only can heavy rain muddy the lakes headwaters, but Weiss lakes major feeder creeks can become downright muddy as well during the early spring season. Even Weiss lakes two major river systems, the Chatooga River and the Little River, that meet at mid lake, can be affected by this constant rain run-off. Of these two rivers the Little River System always clears up first. So keep this is mind if fishing these areas for bass in early spring. Or you can head down the lake for more clearer water conditions. Although March can display a very heavily stained look to the water clarity, its a sure fact that Weiss lake’s upriver flats and its many small cuts and pockets, places that feature off colored water, does heat up a lot faster than deep, clear water – like seen on the mid to lower lake. So if you are fishing either portion of the lake, a switch to another boat launch or a ride up or down the lake, can prove to be a very good game plan during these adverse conditions. 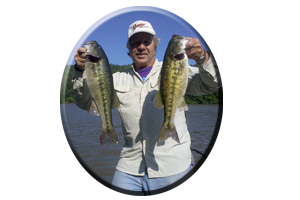 During March a search for these bass along main lake points, around islands, rock bluffs, flats, rip-rap lined rocky banks and around bridges and causeways are places to explore. Drop-offs, ledges and even fishing submerged ridges, humps and sand bars are other attractive spots for Weiss lake’s big, prespawn bass. By the end of March most spotted bass and largemouth bass can be found shallow, or very near shallow water, usually they are in less than 5 feet of water, getting ready to find a mate and beginning their bed making duties. This means these bass are very susceptible to a whole range of lures, those fished from top to bottom. As waters warm close to 70 degrees, these male and female bass will move towards the shallow spawning grounds in early April. By April many changes take place on Weiss Lake. For one, the lake should be on the rise and by mid-to-late April it can be back to full pool. As lake levels rise, so do the bass, right into very shallow water ranging from 1-2 feet deep. Water temperature is very important for the spawn. So is the moon faze. Usually around the full moon of March or even as late as April’s full moon, the majority of Weiss lake’s bass will be bedding. Its all according to the weather. Although weather conditions stabilize in April and the weather always gets better as May approaches, cold fronts can stall the spawning activities of these bass. Water temperatures have to be around 70-72 degrees and stable and the lake level stable as well. Weather conditions warming each day, will show beds in the shallows and most male and female bass bedding. April also shows new aquatic weed growth in the shallows of Weiss lake. Early April these new growing weeds are thin and sparse in some areas. 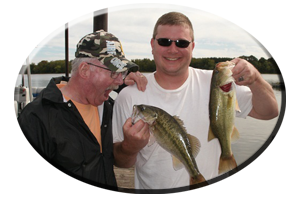 But the adept anglers concentrating their efforts while fishing around the greenest weeds available, can often get in on an early spring, “big bass bite” that other anglers fail to discover. Look for the clearest water, the warmest water and above all the most baitfish infested waters available, around any new growing aquatic weeds for consistent success. Topwater time! 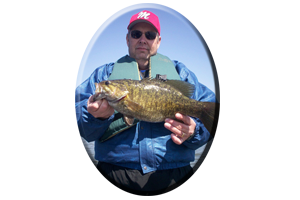 Yes, its been said May is an excellent time to be fishing Weiss lake with lures retrieved across the waters surface. Post spawn bass can get very hungry after the rigors of the spring spawn. Some of these bass have not eaten in weeks and they will blast an obvious, easy looking meal struggling on the waters surface. Topwater lures like buzzbaits, walking type topwaters like zara spooks and popping topwaters or prop bait lures, can get the job done. 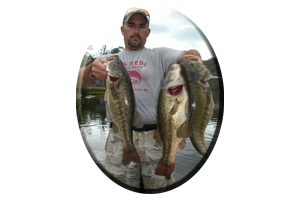 Spinnerbaits are excellent shallow water lures in and around wood and weed cover. * Looking to fish Weiss lake soon? Getting ready to fish a bass tournament on Weiss lake? Always call on Reeds Guide Service…first! 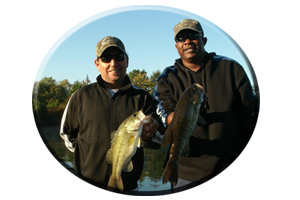 We cater to the pro, novice and anglers that want to learn to fish for bass and stripers! Guiding on Weiss lake and other Alabama lakes for over 30 years. Several boats and guides available year round for multiple parties and corporate guided trips. Discounts available. E-mail me at alabassgyd@aol.com or call Reeds Guide Service (205) 663-1504 in Birmingham, Alabama.